Digital UltraViolet and Digital Copy will makes it possible for you to stream the movie Deadpool 2 HD UV or iTunes Code via MA instantly to your computer and compatible Smartphones, Andriod, iphone, iPod Touch, iPad and tablets devices anytime, anywhere. 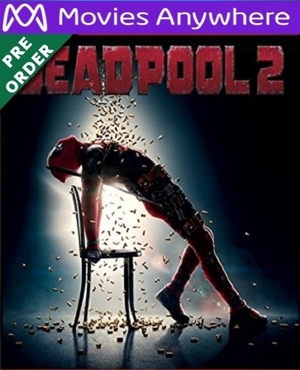 You can also download a Digital UltraViolet Copy or a Digital Copy of the movie Deadpool 2 HD UV or iTunes Code via MA to your computer and compatible devices. - The movie's storyline was derivative, but simple and easy to follow. - The film had major respect for the source material, keeping everything that made the titular character popular intact. - It was an absolutely hilarious laugh-fest. In that movie, people understood that the story was unimportant, as it was merely an excuse to get the protagonist's crazy antics rolling. Yes, the story wasn't a big deal and the character's 4th-wall-breaking or penchant for violence weren't particularly original, but the movie was better than the sum of its parts, and it oozed style. That's why I'm a bit surprised at seeing people suddenly complaining about the sequel's storyline not being anything special. Why the sudden interest in what was never the interesting part to begin with? Deadpool 2 keeps what made the first film great intact, and it actually builds on it. Yes, it has some issues, but every movie does, and they're easy to ignore if you're having a good time. This movie isn't "Logan", and it's not trying to be. It tries to be entertaining, funny and violent, and it succeeds at it with honors. The protagonist is as hilarious as ever, the antagonist, Cable, is an amazing character and the set pieces are brilliant. As I mentioned, story in this kind of film is not important. In the interest of fairness, though, I feel the need to mention the problems with the movie. Among its flaws there's the fact that love interest Vanessa is relegated to an unfortunate infamous trope that leads to her character being absent for most of the film (her presence is even shorter in this film than in the previous one). The fact that her subplot is solved in the mid-credits scene doesn't help things. The movie also has a few moments played for drama rather than laughs (like the previous movie did), but some of them are longer than expected, which leads people to wait for a punchline that never comes. This is, of course, a major problem with comedies that try to inject sudden drama. People don't expect it, so they end up laughing at things that are supposed to be taken seriously. A second viewing makes things better for this kind of thing. Another issue is that the tritagonist can be a bit of an annoying character. The kid's supposed to be a sympathetic character, but the way he's handled it's hard to be upset at the antagonist trying to kill him. This is exacerbated by the fact that he's nowhere young enough to garner sympathy just for being a kid. The last problem with the movie is that not all jokes manage to connect. This is inevitable in any comedy, so I only mention it for the sake of completion. The fact is, all of those problems are minimal, and the movie is so much fun they can all easily be overlooked. In fact, you're unlikely to even notice most of them until you're analyzing the film in your mind several hours after having watched it. It's hard for me to say if this movie is better than the original, but it's at least as good as that one. Yes, the first movie did a few things better. In contrast, this one manages to be better than that one at other things. Bottom-line is, this movie is fantastic, as long as you know what you're getting into: do you like deep character explorations and serious dramas? Go watch Logan instead. Do you like adult humor, wacky situations and lots of violence? This movie is for you. But, for the love of God, do NOT take any children to watch it, no matter how much they like the X-Men, unless you're 100% sure that they can take it.